Another great year of home sales are in the books for Hampton Place and 2017 provided some very surprising numbers when it comes to homes SOLD and the actual sales prices. Compared to 2016, the number of home sales were down by almost 40%. While this seems disconcerting, it was more of less homes for sale issue than the ability to sell the available homes. The good news however was the actual sales prices. Prices rose by about 3% in the past year and no homes SOLD below $300,000 for the first time ever. This is the third year in a row that prices have risen over the prior year. Another indicator of a strong Real Estate Market is the number of days it takes for a home to sell, it took on average 23 less days to sell in 2017 than 2016. 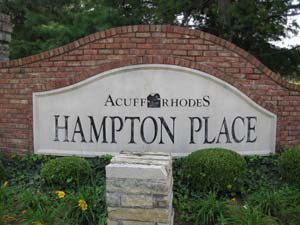 The demand was for homes in Hampton Place remains strong as the numbers of days to sell has shrunk consistently for 3 years now. Overall it was a very good year to be a home seller in Hampton Place, as you will see in our report below. So what does 2018 have in store for Hampton Place? As of this writing there is only 1 home for sale in Hampton Place, which is incredible considering there is roughly 475 homes in the neighborhood. On average you should expect 10% of homes to sell in any given year, in 2017 only 6% of homes SOLD, that leaves a lot of pent up demand for homes in the neighborhood. While we are hoping to see more homes become available for desperate home buyers this Spring, we fully expect this lower than normal inventory to continue and for it to be a very strong Sellers market. We also expect to see home values increase by a similar 3-5% like last year but only through the early Spring/ Summer. We are carefully watching interest rates and the potential for higher interest rates could change the balance of the market in the second half of the year. Spring 2018 has the potential to be the best Sellers Market we have seen since 2005! Considering selling your Hampton Place Home this Spring? Mike Russell & Associates has over 18 years experience including 12 years as a Hampton Place Resident.